DRS (Deposit Return Scheme – also known as Bottle bills or Container deposit laws) are a proven, sustainable method of capturing beverage bottles and cans for recycling. The refund value of the container (usually between 0.05 to 0.25 €) provides a monetary incentive to return the container for recycling. Return rates vary between 75% to 95% depending on the type of DRS chosen. Deposit return systems (DRS) are a proven tool to collect high quantities of empty beverage containers for reuse and high-quality recycling, and are vital to achieving a circular economy. Do we have a DRS in Montenegro? DRS is currently in use in most parts of Montenegro for more than 4 decades already, but nowadays only for a limited number of beer brands. It doesn’t include water and soft drink plastic bottles or other beverages or foreign beer brands. Wine bottles and sparkling water bottles used to be part of this deposit scheme in the past but their recycling has stopped along the way. Why do we need a DRS in Montenegro? As you know, littering is a huge problem in Montenegro and litters are made of in average of 40 to 60% of beverage containers. So the positive impact would instantly noticeable. Furthermore, it is required by the EU Commission to attain a 90% recycling rate for bottles, which can only be realistically achieved through a full DRS. When a retailer buys beverages from a distributor, a deposit is paid to the distributor for each can or bottle purchased. The consumer pays the deposit to the retailer when buying the beverage. 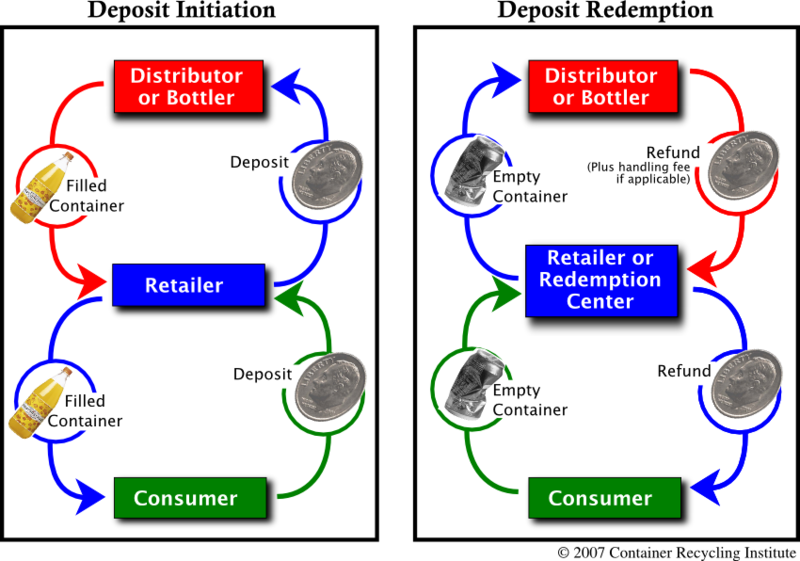 When the consumer returns the empty beverage container to a retail store, to a redemption center, or to a reverse vending machine, the deposit is refunded. The retailer recoups the deposit from the distributor, plus an optional additional handling fee. Concretely, one the retailer has collected the returned bottles, he will send it back via the same truck (that delivers the products to its shop) and which would drive back empty otherwise. The trucks will bring the bottles to the retailers warehouse and which will then bring them back to the central deposit place. There are systems in place where the retailers put the bottles in (reusable) bags with RFID tags for processing at the central deposit place. The bags with RFID tags are given by the Administrator to stores, which send them to Central deposit place/ Counting center – then get the money from the deposit back (on their bank account). How much does the implementation of a DRS cost? If well implemented, a DRS should be self-financing and can cost less than 0.01 € per bottle (like in Norway). There is always a cost to dealing with beverage container waste, whether through recycling or disposal; it will either be borne by government or by brand-owners, distributors, and beverage consumers. 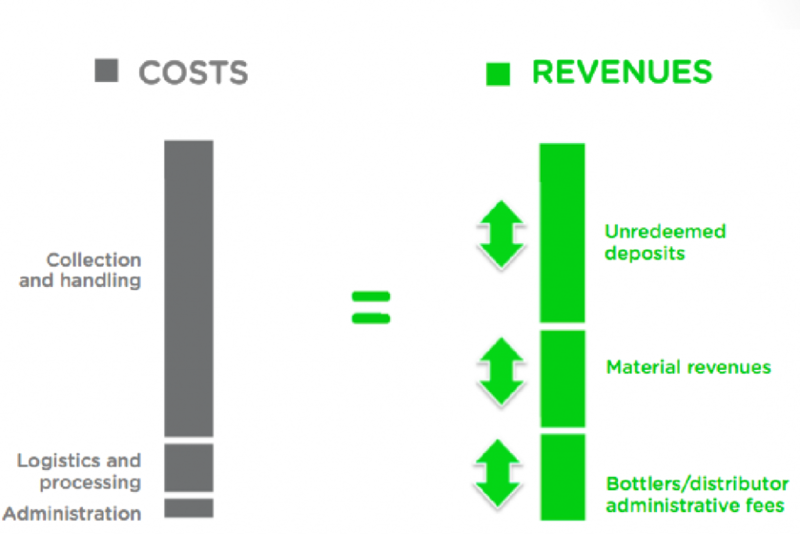 Under deposit systems, the cost of recycling is borne by producers and consumers, not by government and taxpayers. Single-use beverage containers without mandatory return system are actually a corporate subsidy: in the current situation, taxpayers absorb the cost of disposing of beverage containers, through recycling programs (recycling yards), through the costs of landfilling or through the costs of cleaning up the environment. When there is a refundable deposit on beverage containers, the consumers (not the taxpayers) pay the deposit. The deposit is refunded if the container is returned. And the beverage distributors and bottlers absorb the cost of collection. Distributors can choose whether to pass on the cost of handling on to consumers or collection sites *. The costs for handling, recycling and sorting a container vary between 0.01 to 0.05€ per container*. windfall profits on beverage containers that consumers fail to return for the refund: These “unclaimed” or “unredeemed” deposits remain the property of the distributors and bottlers or a central administration in most countries and can amount to large sums: in the USA it amounts to millions of dollars a year. Because with a DRS, 70% to 90% or more of the deposit containers are returned in average, taxpayers pay less for disposal, less for litter pickup, and less for recycling. Beverage containers representing 40-60% of litter in the environment, avoiding 70% of this litter would have a great impact on the tourism industry which is depending on the preservation of the natural environment in Montenegro. What are the successful examples around the world? 4 countries are leading the way in their approach to DRS: Norway, Sweden, Estonia and Finland. On the other end of the spectrum, you will find Germany and USA that haven’t managed to implement a sustainable and fully effective system. Croatia system is very different than others and fully Government controlled. The German system is the only system that is decentralized and is therefore quite expensive. Despite a high-return rate, Croatia has currently a limited control of what is being put on the market. It is important that the DRS Administrator is not only responsible but accountable for the whole system and its results. What those 4 countries are doing that works is having put in place a system that is sustainable in the long-term. They have appointed an Central DRS Administrator that is solely responsible and accountable by law for the implementation and operations of the DRS. This administration is run as a non-profit model. It is important that no parties is making profit over the system: the goal of the Administration should be to reduce the operating costs of the DRS. Their Administration is owned by the beverage industry and retail industry. The main source of income of the Administrator are the unredeemed deposit, the sales of the material recovered through the DRS and a fee from the industry: the fee should fill the gap between the Administrator operating costs and the revenue from the unredeemed deposit and sales of material – in order to be cost neutral. So the most effective the system is, the lower is the fee from the industries. The cost effectiveness of the system is a requirement for its success. In order to motivate the industries to become a member of this Administration, Norway and Switzerland have opted for the following legislation: Government raises very high taxes for bottles sold on the market which are not part of the deposit scheme (this could be extended to bottles not being reused or recycled). This tax (0.5€ per bottle in Norway) is going into an environmental fund. If the system is centralized, and non-profit, then the system is very cheap for the producers and retailers, between 0.01 € (Norway) to 0.05 € Per bottle. In Spain it is less than 0.007 € per container. What are the components for successful DRS? Deposit level must be high enough to incentivize collection. Centrally reported sales data by size and material type. Convenient collection points / no extra trips minimal extra time to redeem containers. Modern data management system (Bar code recognition / on-site compaction). Taxing producers or retailers on the sales of bottles has shown to be ineffective in several countries. It works better to have obligations and impose a deposit. As an example, the Spanish government which is currently working on its DRS law worked with 2 options, but decided to be working towards deposit rather than taxes as it is a more positive approach. It is important that the Government imposes the deposit fee in the law. It also needs to define what kind of beverages are in the system, the volume and most importantly: defining the obligations of the producers (it is crucial that the producers have obligations to report amount of products placed on the market – also to avoid fraud). Which international institutions recommend DRS? In line with new definition of Extended producers’ Responsibility:”EPR is a set of measures taken by Member States to ensure that producers of products bear financial responsibility or financial and organizational responsibility for management of the waste stage of a product’s life cycle …” ERP will become mandatory in EU (around 2022) for all producers. Opponents to DRS include beverage container manufacturers, soft drink bottlers, beer, wine and liquor distributors and retail grocers, as they prefer the costs of dealing with beverage container waste remaining with the government and the taxpayers, by trying to minimize the DRS’ effectiveness and maximize their costs. Coca cola may not want to make the effort to do independent bar codes in Montenegro (which is required to prevent fraud). It can be enforced by law: in many countries, all bar codes must be unique to the country or a tax has to be paid per bottle which doesn’t have a unique bar code. In Norway, companies introduced with Nordics bar code have to pay more. Lower for national bar code. International companies will adapt to the law of the country. But if the law is not specific enough in terms of what their obligations are, they will take advantage of it. It is therefore important for the Government to define the obligations of the retailers and bottlers in the law. Machines and unclaimed deposit and plastic material should be owned by the Administrator in order to limit fraud (and not by the retailers). It is highly recommended to have the system registered with the bar codes then it is not possible to cheat. Reporting from the bottlers is recommended to be made by bar codes as well (see guidelines of recommended obligations). It is recommended not to let private-owned parties involved in counting manually the bottles, as it can’t be control. To redeem above 20 € at once, it is recommended to ask to show your ID. If deposit is low, there won’t be much value in illegal import of bottles. If is too high you might get a 200% return rate! It is therefore important to set the deposit fee right. It can be done through a WTP (Willingness to Pay) study. Deposit fee doesn’t necessarily need to be high to get a high level of return. In Croatia for instance it is 0.05 € It feels unnatural to trash money so people do mind about the value of the bottles. The deposit value could even be represented by a sticker on the bottle in the shape and form of the coin of its value. In Spain they recently decreased the proposed value from 0.20 to 0.10 €. Deposit fee has been set to 0.10 € in Spain. We suggest to look at the beer bottle deposit in Montenegro as reference point. If an organization or the government sees DRS as an income source, there is a high risk that the DRS will fail as it won’t be sustainable. The DRS needs to be cost-effective to remain sustainable. Therefore a central (non-profit) administration to manage it is highly recommended. The deposit should never be financing the system for it to remain sustainable. Reverse vending machine and manual return should have a different handling fees. Reverse Vending machine compacts the bottles to gain space. For the bigger shops, it is recommended to have Reverse Vending Machines in place that can automate the process of collection. This allows to avoid fraud, error (manual process would take back in average 10% of bottles which don’t have a deposit on) and gain time. Those machines can either crush plastic to gain place or take back reusable bottles such as glass bottles. They identify the bottles by the material, their bar code, and their size. They can take Alu can, HTPE, refillable glass bottles, crates, PET. For small shops, it is recommended to encourage manual take back with transport of returned bottles via the transportation truck. Norway has a similar geography as Montenegro and use manual take-back in remote areas. It is recommended that retailers pay for the machines via a handling fee. It is not mandatory to have them, but they want a RVM they will have to pay a handling fee to the Administrator. No handling fee for manual take-back. It should mandatory by law that every retailer takes bottles back. Even gas station must take them back and pay deposit back in cash. Convenience for the consumers is one important criteria of a successful DRS system. This report is being made available to the public for non-commercial use – please ask written permission for using it partially or fully and mention Zero Waste Montenegro in the references and copyrights.